An HDFS is not typically deployed within the HDInsight cluster to provide storage. Instead, an HDFS-compatible interface layer is used by Hadoop components. 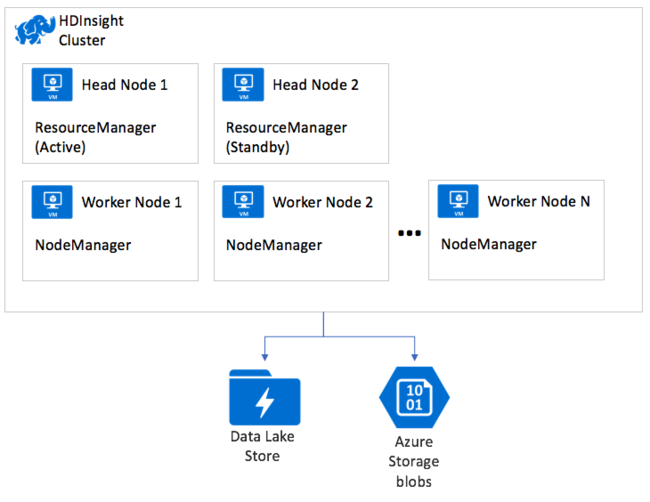 The actual storage capability is provided by either Azure Storage or Azure Data Lake Storage. For Hadoop, MapReduce jobs executing on the HDInsight cluster run as if an HDFS were present and so require no changes to support their storage needs. In Hadoop on HDInsight, storage is outsourced, but YARN processing remains a core component. For more information, see Introduction to Azure HDInsight. This article introduces YARN and how it coordinates the execution of applications on HDInsight. The ResourceManager grants cluster compute resources to applications like MapReduce jobs. The ResourceManager grants these resources as containers, where each container consists of an allocation of CPU cores and RAM memory. If you combined all the resources available in a cluster and then distributed the cores and memory in blocks, each block of resources is a container. Each node in the cluster has a capacity for a certain number of containers, therefore the cluster has a fixed limit on the number of containers available. The allotment of resources in a container is configurable. When a MapReduce application runs on a cluster, the ResourceManager provides the application the containers in which to execute. The ResourceManager tracks the status of running applications, available cluster capacity, and tracks applications as they complete and release their resources. The ResourceManager also runs a web server process that provides a web user interface to monitor the status of applications. When a user submits a MapReduce application to run on the cluster, the application is submitted to the ResourceManager. In turn, the ResourceManager allocates a container on available NodeManager nodes. The NodeManager nodes are where the application actually executes. The first container allocated runs a special application called the ApplicationMaster. This ApplicationMaster is responsible for acquiring resources, in the form of subsequent containers, needed to run the submitted application. The ApplicationMaster examines the stages of the application, such as the map stage and reduce stage, and factors in how much data needs to be processed. The ApplicationMaster then requests (negotiates) the resources from the ResourceManager on behalf of the application. The ResourceManager in turn grants resources from the NodeManagers in the cluster to the ApplicationMaster for it to use in executing the application. The NodeManagers run the tasks that make up the application, then report their progress and status back to the ApplicationMaster. The ApplicationMaster in turn reports the status of the application back to the ResourceManager. The ResourceManager returns any results to the client. All HDInsight cluster types deploy YARN. The ResourceManager is deployed for high availability with a primary and secondary instance, which runs on the first and second head nodes within the cluster respectively. Only the one instance of the ResourceManager is active at a time. The NodeManager instances run across the available worker nodes in the cluster.